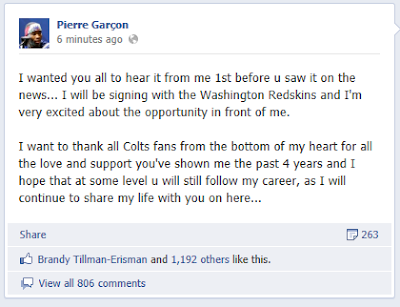 According to a Facebook Page that seems to legitimately be Pierre Garcon, he has signed with the Washington Redskins. Garcon had a career year last season with 947 yards despite the fact that he was catching passess from some of the worst QB's ever on one of the worst teams ever. He looks like he could go for 1,000+ and 10 TDs, maybe not in RGIII rookie year, but soon after.